Haynie said the county would install the gravity line for treated sewer water and another gravity line to collect untreated sewage, which then would be pumped back upstream to the county’s sewage plant on the outskirts of Watkinsville for treatment. Such a system actually would require three sewer lines, one to carry treated water downhill, one to carry untreated sewer water downhill, and a third to pump untreated sewer water uphill to the sewer plant. 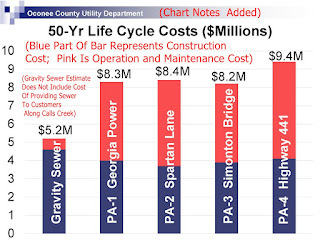 Haynie didn’t include the costs of the two additional lines and the required pump station in his comparison of costs for the gravity sewer line with other options, which Haynie argued were more costly and less efficient than the gravity line. 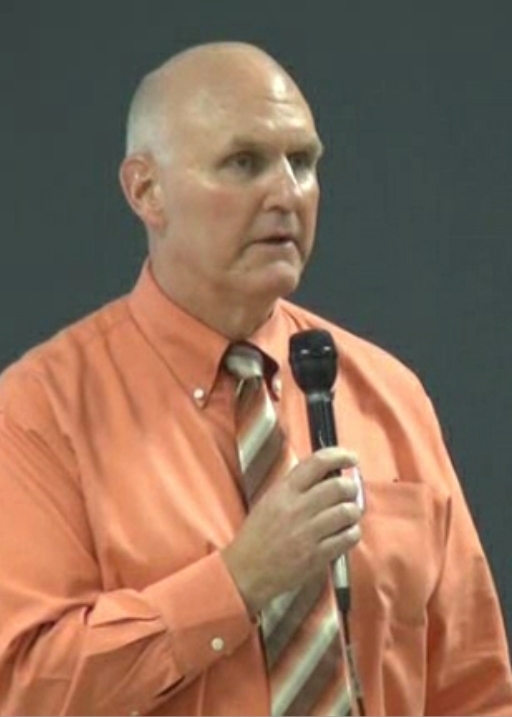 Haynie made his argument about the attractiveness of the Calls Creek sewer line in response to a question from Cindy Mitchell McGarvey, a realtor and one of the organizers of the group, Friends of Calls Creek, which has been fighting the sewer proposal. McGarvey had noted Haynie’s argument, advanced in several settings before the Oct. 26 Town Hall Meeting, that Millennials would want to purchase properties along Calls Creek once the line was installed because of the availability of sewers service. McGarvey asked Haynie if his plan for sewage treatment for the neighborhoods didn’t presume that the county would build a sewage treatment plant on the Middle Oconee River to treat the sewage from the neithborhoods. A sewer plant on the Middle Oconnee has been proposed in the past. Haynie said a Middle Oconee sewer plant was not necessary for the county to provide sewer services to the homeowners along the Creek. If the county decides to build the gravity sewer line down Calls Creek, Haynie said, “we will lay a sewer line to serve the residences along that stream” at the same time as the county installs the gravity line. I asked Haynie in an email message on Oct. 28 if, in fact, he needed a third line to pump the sewage back up the creek to the sewer plant, and Haynie responded that same day that a third line was needed. “The 3rd pipe (force main) was implied, incidental to providing sewer service,” Haynie wrote. The county has not looked at the plan for sewer service along the creek “in detail,” he wrote. Other routing options for the two additional lines “could be considered, depending on local interest,” he wrote. “Cost estimates for such a system have not been developed,” he added. 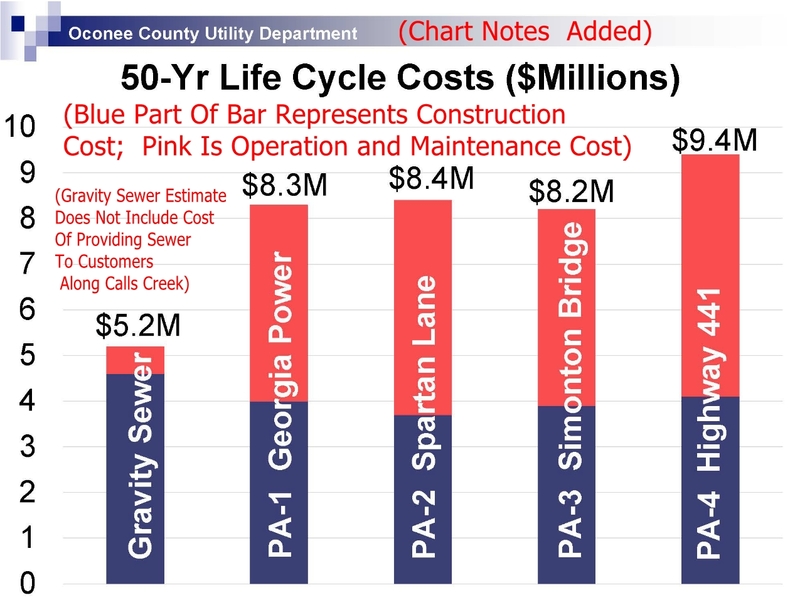 At the Town Hall Meeting, Haynie compared the gravity sewer line down Calls Creek with four options for getting the treated sewer water from the Calls Creek plant to the Middle Oconee River. The first of these would follow much of a Georgia Power easement, while a second would follow Spartan Lane. The third would follow Simonton Bridge Road, and the fourth would follow U.S. 441. All four alternatives would require pumps, rather than simply gravity, Jimmy Parker, a consultant to the county, told the audience. One goal of the county is to use as few pump stations as possible, Haynie said. Parker said his analysis showed that the gravity sewer line would cost the most to build, at $4.6 million. That figure did not include the costs of the two additional lines Haynie said would be needed to provide sewer services to the residences along the creek. The gravity alternative would have a 25-year-life-cycle-cost of only $4.8 million, Parker said, compared with $5.9 million for the cheapest alternatives, the Georgia Power Line and Spartan Lane routes. The higher costs for the alternates reflects their dependence on pumps. The costs of a pump needed to provide residential sewer to the homeowners along Calls Creek was not included in the estimates of operating costs for the Calls Creek gravity sewer line. The Oconee Enterprise recreated the charts used by Haynie at that meeting and presented them on the front page of its Nov. 3 edition. One of the charts made it appear as if the Calls Creek sewer line would be the least expensive line to build. It is the most expensive. The front-page story on Nov. 3 had another error that the paper didn’t correct. The homeowners have championed those cheaper alternatives. The exchange between McGarvey and Haynie regarding the attractiveness of sewer service to Millennials is in the video clip below. The full video of the Town Hall Meeting is available on the Vimeo site of Oconee County Observations. OCO: Millennials and Sewers from Lee Becker on Vimeo. The Enterprises printed an error? Shocked. Shocked! The details are sure to make our eyes glaze over. Then again, that's where the devil is. this is totally insane. the county is being hoodwinked while it's being robbed and raped. i have been in hickory hills on a septic tank since 1988 without the slightest problem. I DO NOT WANT SEWAGE TREATMENT FROM OCONEE COUNTY NOW OR EVER. this notion has never ever even been on the table during this whole fiasco. now THREE sewage pipes down calls creek, INCLUDING ONE PUMP LINE CARRYING RAW SEWAGE BACK UPHILL TO THE PLANT!!! haynie has lost his mind. Mr. Haynie is tangling an imaginary carrot in front of the Calls Creek property owners. If pumping stations are too expensive, I doubt they will ever build one for the Calls Creek people. This is a tactic to quiet them down. I think they are smarter than this. Haynie, be professional and include the cost of all three lines! Three lines instead of one...gee, funny Melvin or Haynie never mentioned that before. Three times more likely to have spills. I've worked with pump stations pushing sewage uphill...big maintenance costs and very unreliable. Y'all voted for the same old middle age/senior citizen insider conservative Republican Caucasian males. Had a chance to elect Penny Mills and/or Sarah Bell, who were against Calls Creek sewer. Instead y'all voted for Mark Thomas, member of the Oconee County Industrial Development Authority, and re-elected Mark Saxon, who enabled Melvin for years. Melvin has a few weeks left...if the No Sewer Calls Creek crowd doesn't raise heck, he's going to push this through, with Haynie, before he leaves office.